South Korea’s top court on Thursday ruled in favor of Korean victims who were forced into labor during Japan’s colonial rule of the Korean Peninsula, ordering a Japanese company to compensate them for their unpaid work and reaffirming that an international treaty does not negate an individual’s rights to seek damages. The Supreme Court upheld two lower court rulings against the Japanese company Mitsubishi Heavy Industries Ltd., and ordered payments in the amount of 80 million won ($71,500) to the families of each of the six men who were forced to labor and 100 million to 120 million won to four female victims of forced labor, in separate cases. The decision handed down by the four-judge bench on Thursday recalls last month’s Supreme Court verdict in another case, upholding a 2013 lower court ruling against Japan’s Nippon Steel & Sumitomo Metal. The top court ordered Nippon Steel & Sumitomo Metal to pay 100 million won each to four victims of forced labor, saying they had a right to compensation despite the 1965 treaty signed between the two nations to resolve colonial-era issues. In the Mitsubishi case, five survivors of forced labor and one family of a deceased victim filed for damages in 2000 for making the six men work at its Hiroshima munitions and shipbuilding plant without pay in 1944. But as the legal fight dragged on, the five survivors all passed away and the families continued with the lawsuits. The female victims filed for damages in 2012, claiming they were tricked into joining the Korean Women’s Volunteer Corps and were forced to work without pay at a Mitsubishi aircraft plant in Nagoya, Japan, in 1944. They sued the Japanese company in Japan, but that country’s highest court ruled in favor of Mitsubishi in 2008. “I lived all my life in tears, and could not say anything. 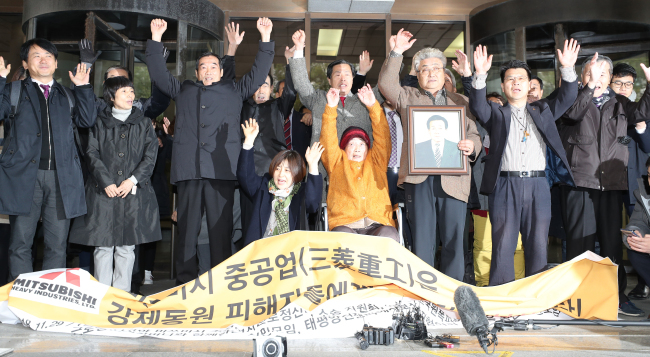 Japan should sincerely apologize and compensate,” Kim Seong-ju, 90, said in a press conference after the court’s ruling. “(The Japanese company) said they would let me go back (to Korea) whenever I wanted, but they did not, even when my younger brother died,” she said, shedding tears. In a statement, Japanese Foreign Minister Taro Kono said the ruling violates the 1965 pact signed by the two governments for the normalization of their relationship, in which, he claimed, all reparations for Japan’s colonial rule of Korea from 1910 to 1945 were settled. “Above all, the decisions completely overthrow the legal foundation of the friendly and cooperative relationship that Japan and the Republic of Korea have developed since the normalization of diplomatic relations in 1965,” Kono said in the statement. Japan’s Vice Foreign Minister Takeo Akiba also summoned Seoul’s Ambassador to Tokyo Lee Su-hoon to lodge a formal protest. Over Japan’s reaction, the ministry expressed regret and called for restraint, while reiterating its stance that it hopes to develop “future-oriented” relations with Japan.